A quick note on the new website: if you have been unable to register there because the software thinks you're a spammer: I have taken down the spam protection for today only. Please go re-register if, and only if, you've met the requirements for registration. But if you have met the requirements, but couldn't sign-up previously due to the spam blocker, then please go register today. You should now be able to create an account. Many thanks! Yesterday gave a lot of credence to the idea that the correction is still unfolding. This is the type of whippy market that can confuse a lot of people and get traders looking the wrong way. The first chart I want to examine is the INDU, which may be conveying some important clues. This chart leads me to the conclusion that the decline yesterday was probably part of the still-ongoing correction. 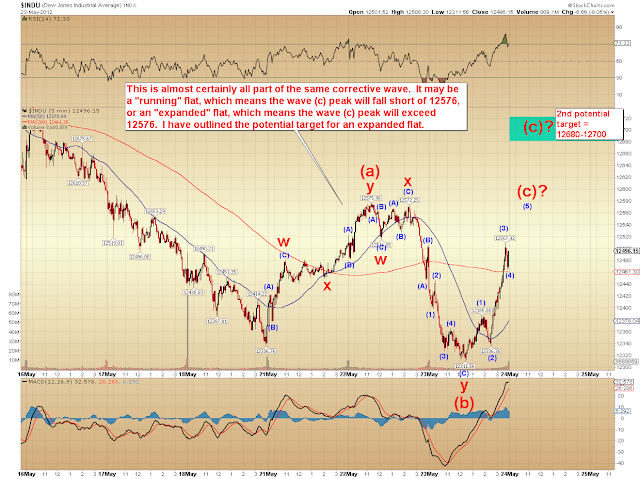 That does not necessarily mean the market will break the recent swing highs, though (see annotations). The INDU made a new low, but that decline doesn't look impulsive. It actually looks like a complex w-x-y correction. This could lead to one of two outcomes, both explained on the chart notes. The next chart is the SPX, and the strength of the rally looks characteristic of a c-wave up. I'm starting to give a lot more consideration to the alternate count's idea that the recent lows actually marked ALL OF wave i down, and that wave i had an extended fifth. COMPQ (not shown) really looks like an extended fifth to me. Again, the chart notes explain what to watch here. 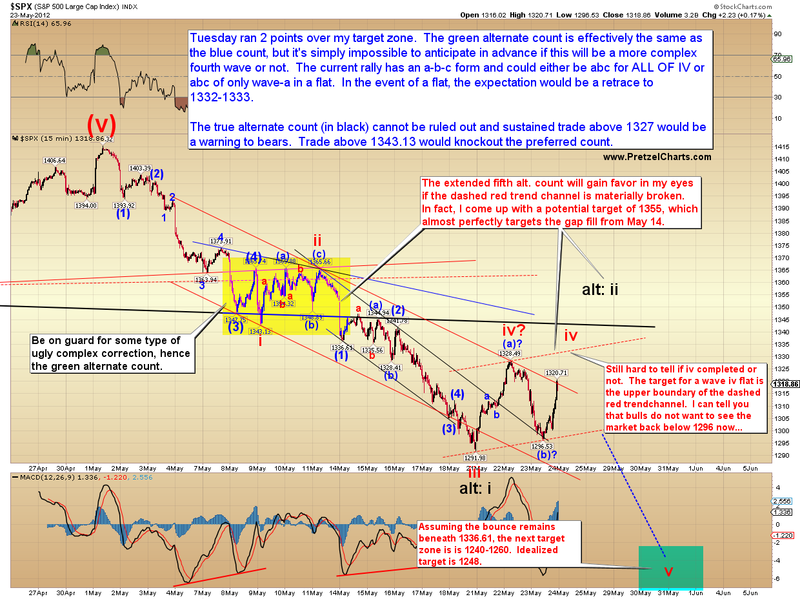 It's still possible that the decline yesterday was a first wave down, and the rally is a second wave. Trade above the 1328.49 high would knock out that possibility. NOTE: The "gree alternate count" is no longer shown on this chart, but has been replaced with the blue (a) and (b) labels and the red iv. Sorry for any confusion. Finally, a quick update on CVX, which also leaves open the potential of an extended fifth, in the form of an expanding ending diagonal. Of course, it could be a leading diagonal instead. 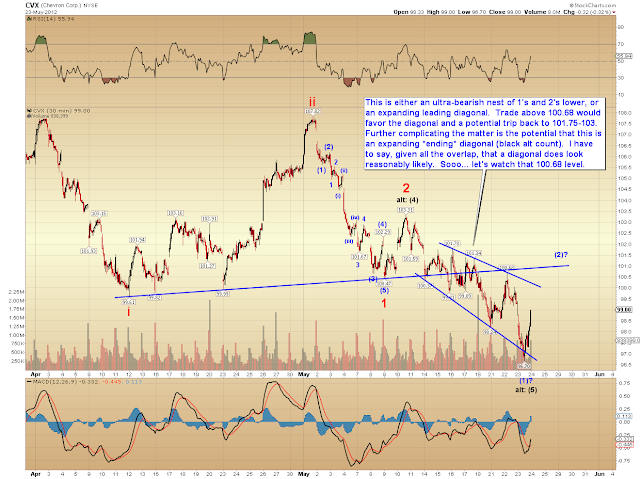 And... it could also be a bearish nest of 1's and 2's. Things were easy since the beginning of May (at least, for our team here, anyway! ), and it's normal for things to get a bit hazy every now and then. The key to continued trading success is not to give back all your profit when the market turns weird. It will all clarify soon enough. In the meantime, stick to low risk entries and honor your stops. As you can see, there are a number of options right now. If you're going to play, take the low-risk entries near the key levels and stay nimble. I'm genuinely not sure which outcome the market has planned. I do feel reasonably confident, based on the INDU chart, that there are still new lows out there -- but there is a bit of question to the market's short-term path. It may be that the 1328 high holds, and the market declines straightaway -- or it may be headed back to 1355 first. As I said, look for low-risk entries. In conclusion, I would leave you with this thought: No one knows exactly what the market's going to do at all times, nor do we need to... we only need to have a reasonably good idea often enough to make money. Trade safe. PL, I have posted in the past as Johnnie Flukie Redding. I tried to register yesterday as LITVAKMATT. May I join your forum please? I'm JC4. I'll log in with Yahoo and username will be: rbaselt Thanks! Perhaps i registred 3 weeks ago as italaw.